The 2019 CBA AL-Star Weekend came to an end in Qingdao, capital city of east China's Shandong Province on Sunday. The South beat the North 160-145 while champions of the single events-skill challenges, dunk contest and 3-pt contest-were determined. Weize Jiang (182-PG-00) from the Jilin Northeast Tigers claimed the title of the skill challenges by finishing the final with a record-breaking 26.5 seconds. He passed the bounce-pass part, the chest-pass part and the 3-pt part both by one shot, breaking the previous record of 26.7 seconds by Wang Zirui in 2014. Thanks to his incredible performance, Jiang not only won the 10,000 yuan (1,478 U.S. dollars) prize for the champion title, but also another 30,000 yuan (4,436 dollars) as a record-breaking bonus. Chen LinJian (198-F-93) from the Fujian Sturgeons won the 3-pt shooting contest after competing against Du Runwang from the Guangdong Southern Tigers. The defending champion Yu Changchun from the Jiangsu Dragons played in the match before Chen and Du eliminated Yu 21-20. Then in the 30-second OT, Chen shot first and scored 11 points, beating Du's nine points to claim the championship of the 3-pt contest. Zhang Jianhao from Guangdong University of Technology took the title of the dunk contest with a total of 79 points, defeating Huang Rongqi from the Sichuan Blue Whales who scored 72 points. Since the biggest champion candidate, Wang Tong from the Shanghai Sharks had to miss the final because of an injury, Zhang and Huang had only each other to defeat. In the two rounds of the contest, both Zhang and Huang failed to finish one of their moves so each had 30-points. Zhang failed the first round while Huang failed the second. With a two-handed dunk, Zhang got 49 points in the second round which beat Huang's 42 in the first round, making Zhang the dunking champion of 2019. In the grand-finale All-Star Game between the South of the North, the South made as many as 24 three-pointers, 18 more than the North. Though there were no foreign players in the first-lineups of the two teams, foreign players became the biggest highlights on the court. 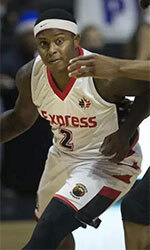 Joseph Young (188-G-92, college: Oregon) (South) from the Jiangsu Dragons became the All-Star MVP with a remarkable 40 points and six assists. Meanwhile, Jimmer Fredette (188-PG-89, college: BYU) (South) from the Shanghai Sharks made 11 three-pointers, breaking Wang Shipeng's record of making 10 in the 2007 CBA All-Star Game. By contrast, no Chinese player from the South scored over 20 points. In the North team, Shabazz Muhammad (198-SF-92, college: UCLA) from the Shanxi Loongs scored the highest 28 points followed by 26 points from Chinese guard Guo Ailun from the Liaoning Flying Leopards. 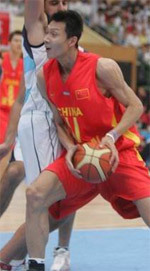 Guo also delivered the court's highest 15 assists. The South established a solid leading advantage in the first quarter (40-29) and once led by 17 points. Though the North kept chasing in the rest of the game, they never managed to lead in any the following three quarters and had to watch the South claim the victory again after 2018.